Eduardo Rodriguez allows two earned runs in 52/3 innings as Boston holds off Baltimore. 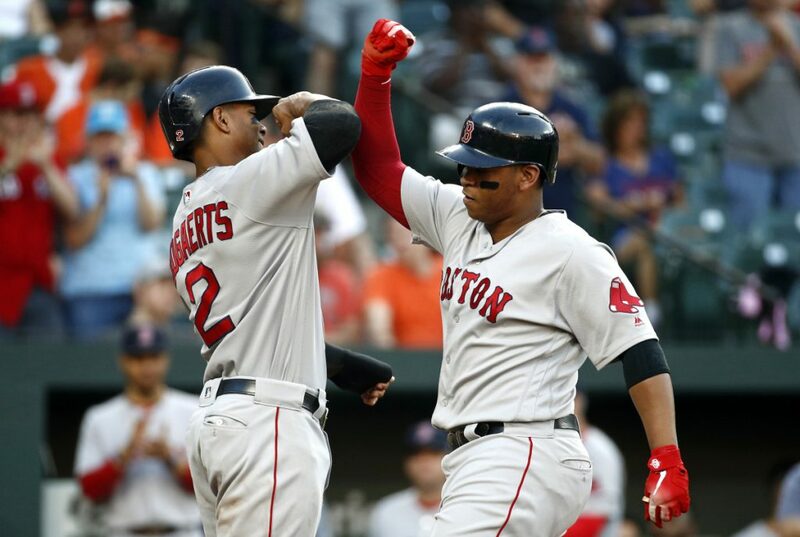 BALTIMORE — Andrew Benintendi and Rafael Devers hit home runs to support a solid start from Eduardo Rodriguez and the Boston Red Sox held on to beat Baltimore 6-4 on Tuesday night. Rodriguez (8-1) gave up two earned runs, including a leadoff home run to Joey Rickard, in 5 2/3 innings for the Red Sox. He struck out four and walked two. A two-run homer by Devers in the second gave Boston a 2-1 lead. Benintendi’s homer in the third pushed the lead to 3-1 before Rickard scored on a single by Danny Valencia to pull Baltimore to within a run. But Boston came back with two runs in the fourth on a bases-loaded walk and a bases-loaded balk. An RBI single by Christian Vazquez pushed the lead to 6-2. Craig Kimbrel came on to pitch the ninth inning for Boston and made it interesting. Kimbrel walked two batters before Matt Trumbo drove in two runs with an opposite-field double to make the score 6-4, bringing the tying run to the plate before Kimbrel got Pedro Alvarez to ground out and end the game.